Choosing the right promotional gift to hand out at events or give away to customers can make a big difference, but it is important to think carefully about which types of promotional items will work best for your business. When you pick your promotional gift, you will need to make sure that it is valuable enough to your customers that it will enhance your brand and so useful that they will want to carry it around with them. You can achieve this by using clever tactics such as handing out USB sticks pre-loaded with top new apps or links to your own website, making sure your customers get a free branded umbrella to use on a rainy day, or handing out water bottles or paper fans at an event held during a heat wave. You can also make your promotion more successful by choosing an item that will prove useful to your customers in their working lives. One of the best new trends in functional promotional items is the branded Powerstick or Power Bank, a tiny, portable charger that you can use to power up devices like mobiles and tablets on the move. It fulfils all of the requirements of a great promotional gift. What Makes a Good Promotional Gift? 1. Branding: If a promotional gift is going to serve its purpose, it has to be branded with your company name or logo. People need to remember who gave it to them so that they are more likely to think of you when they need the types of products or services that you sell. 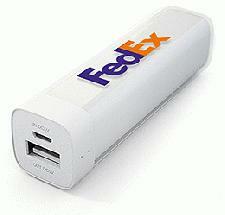 Power banks can be branded with your logo to make it clear where they came from. 2. Appropriateness: Promotional items work best when they are closely tied to your company's image or to what it does. You should choose a gift that fits in with your wider marketing campaign and which has a clear link to your brand. For example, a power stick would be a particularly appropriate gift for a technology or travel gear company to hand out, or if your brand marketing focuses on how reliable your company is, or how well it helps customers when they are facing an unexpected crisis. 3. Portability: If you are handing out a promotional gift, it needs to be small enough to slip into a pocket or bag, and light enough to be carried around all day. Not only will this ensure that attendees at conferences or other events keep hold of your gift, it will also make it more likely that they will carry it around with them after the event, if they find it useful enough. This could bring your brand into the sight of many more people than you can reach directly. 4. Usefulness: Being portable is important, but it is not enough to ensure that people will actually carry your promotional gift with them. The items you hand out also need to be useful enough that people will want to keep hold of them and bring them out to use. A powerstick is a great example of a gift that is portable and functional. It might be taken to business meetings and presentations, carried on business trips, or used as an emergency source of power during a blackout. A powerbank could even help business travellers to ensure that they don't get caught out by airport security asking them to turn on their devices before they can board a plane. The more your promotional gift is used, the more often your branding will be seen, so choosing something that will be useful many times over is a great idea. 5. Innovation: A surprising promotional gift that people haven't seen before will always give your company an edge over the competition, so choosing an item like a powerstick could make your gift stand out from the more conventional promotions devised by other companies. A unique, interesting gift will make your company seem more forward-thinking and innovative. It will also make you more memorable, even at events where lots of different gifts are being handed out by different companies, and it will make it more likely that recipients will talk about you to other people. A good gift could be enough to make someone recommend your stand to another exhibition attendee, or to spark a conversation about where the item came from when someone sees it being used. Many thanks to Emma Dalton for this contribution, (freelance content writer).